I am back. I had been away for a very long time because my daughter got sick and was brought to the hospital. Good thing she is okay now and I am trying to go back to blogging again after two weeks of being away. I have created a round-up of DIY pendant lights before but wasn't able to share it to you at once. So, I will be sharing it with you today. I know you will be surprised and impressed of this list! 1. Cute teacups and saucers from Gregory Bonasera that will lighten up your space! 2. The gummy bears aren't the yummy ones but these are acrylic bears that Kevin Champeny used. Looked real! 3. Sugar and Cloth shows us that a cardboard can be as gorgeous as this! 4. Here is another pendant light made from cardboard. A brilliant idea from The Design Files! 5. Featured in Design Sponge, this one uses paper cups to create a lovely lighting! 6. Gather pompom yarns together and you will get a light like this one from A Subtle Revelry. 8. Make one for yourself using paper! Gabrielle Guy was very creative indeed to come up with this lighting! 9. Music lovers will be happy with what Ludwig metals have done to this drum set! 10. A Beautiful Mess always impressed me with her DIYs just like this one made from different fabrics! 11. Eskayel teaches us to recycle and turn those food and beverage containers into a pendant light! 12. Overlap doilies around a balloon and you will get a pendant light like what Dosfamily did. It is perfect for your chic interior! 13. Love Maegan brought in a beach-y or nautical feel to her home with this lighting using ropes. Add some tiny beads or cystals to make it look more elegant. 14. Another way to recycle is to use plastic bottles to make a fab lighting! Thanks to Michelle Brand for the idea! Who would think that this is actually possible? 15. Natalie Sampson showed us that putting together some hangers can turn it into a lighting! 16. Don't throw away the tabs from canned beverages because you can turn it into a beautiful piece like this from The 3rs Blog. 17. Be Cleverly Inspired and give your home an industrial feel using metal sheets! 18. Weekday Carnival used bended metallic tube to create a geometric light for a modern touch. 19. You will feel Bit of Green by combining plastic cups together for your pendant light! 20. Stacie gave us an idea on how to create lighting fit for a travel themed bedroom. 21. Anyone who loves mason jars will like this one from We Design Studios. This will give a subtle vintage touch to your space. 22. 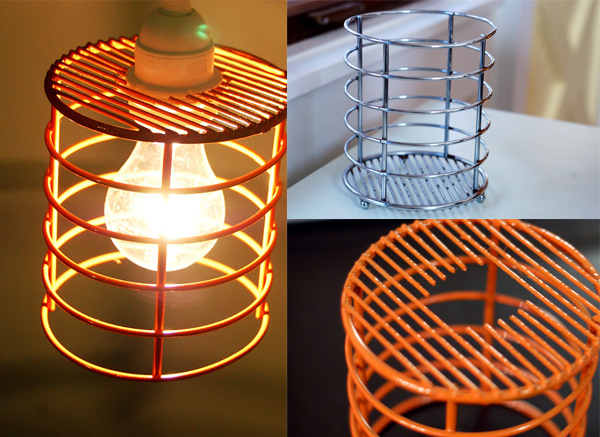 If you have a colander that you no longer use, Shelterness teaches us how to make use of them. 23. Marzdesigns shows us a tutorial on how to make this beautiful bright beads pendant light. 25. Another lighting made from paper as featured in Design*Sponge. 26. Brit + Co. is one of my fave blogs especially for DIYs because they are just awesome like this wooden beads pendant light. 27. Bring your utensil holder to your ceiling by turning it into a pendant light. Thanks toTake the Side Street for the idea! 28. A West Elm Inspired Globe Pendant by Mad in Crafts using two salad bowls. 30. Quirky halo lights that go around the bulbs! Another one from A Beautiful Mess. 31. If you love tassels then you will like what A Subtle Revelry did to this one! 32. If you haven't tried making something from concrete, this one from Brit + Co. might urge you to try! 33. Zipper Lighting has different lighting like this that are covered by paper scallops. This one used old comics which turned out very colorful. 34. Mark Montano used two bowls in making this one and added butterflies for more fun! This would be great for a girl's bedroom! 35. DIY Eames Inspired Bohemian Pendant Lamp from Love Maegan that is really a true charmer! 36. Sew buttons together and make a pendant light like this from Pretty Handy Girl. 37. Inexpensive white paper lanterns can look this great! Know how Design Love Fest did it! What a list! You can really make whatever you want to make with just anything you find in the house as long as you are creative! I am working on my bedroom and I was looking for DIY lighting to make. That is why I decided to make this round-up for you. Which is your favorite lighting? Which one would you give a try? i cant believe all these are diy! i love the gummy bears and mason jars the most! Wow.. i totally love the teacups concept. I saw from the restaurant here in our country a light bulb that is so large! I am more into traditional house decor, but among these, the one I liked the best would be that yarn around the balloon lamp. I do not know if I want to do it myself though. Hehe. Thanks, now I don't have to hop into malls just to see drop light designs. Bookmark this post. OMG! Are you kidding me? This is awesome. Just beautiful. I had no idea we could make our own holders! Amazing! Wow, these are amazing! So many to choose from, I can not pick a favorite. The one from the pop bottles is pretty cool and huge! A true work of art! These pendant light ideas are original and perfectly compliment the interior of the homes on the pics. I love the modern spirit they bring into the whole atmosphere of the cozy homes! My favorites are the bohemian light, the crochet one and the one made from rope. I would love to have them all in my house. I know that my son would like the cartoon one in his room. The signs of the lights are really creative. Having this at the house would be really nice. More DIY lights as an arts and full activity designs. well, i liked the "cup and saucer" for it looks good and classy. It's so creative! I really envy people who can do all these stuff, as I'm not an artistic person. So amazingly creative!~ Great home-deco idea! I love 5, 7 and 21. Some of the others look like it would be a nightmare to clean!